For a limited time, BackupWorks.com is offering a FREE Apple iPad Mini with purchase of select Iomega StorCenter NAS Storage Devices while stocks last. Buy a px12-400r (36/48TB) or px12-450r (36/48TB) StorCenter NAS and get a brand new iPad Mini 16GB courtesy of BackupWorks and Iomega. Q: What is the BackupWorks Iomega NAS Promotion (April 1, 2013 - April 30, 2013) while stocks last? A: Purchase the following Iomega NAS Storage Units and receive a FREE Apple iPad Mini 16GB. A: The Promotion is effective from 12:01am, PST, April 1, 2013 until 11:59pm, PST, April 30, 2013. ALL ORDERS MUST BE PLACED BY April 30, 2013. NO EXCEPTIONS. While Stocks Last. Q: What Iomega NAS Storage Arrays are eligible for the FREE Apple iPad Mini 16GB? A: Order Min. qty of 1 of any of the above units and we will include a FREE iPad Mini 16GB, or call your BackupWorks Rep at 866 801 2944, Note: Free Ipad Promotion may ship seperately from unit purchased. Q: Is there any limit to the number of Iomega NAS Storage Arrays that the Customer can order with the Promotion? 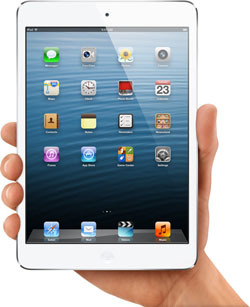 A: No - Only 1 FREE iPad Mini per customer.